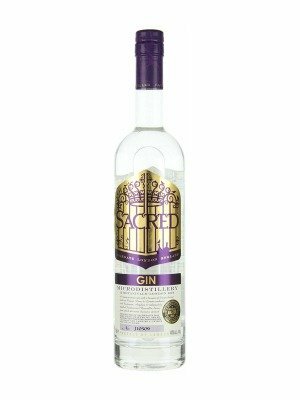 Sacred Gin is a popular Gin available from DrinkSupermarket.com in 70cl to buy online. Visit DrinkSupermarket.com for the best price for 70cl of Sacred Gin or compare prices on our other Gin products. A boutique artisanal hand distilled gin produced in small batches in Ian Hart's award winning microdistillery in London. Rich creamy notes of fresh Citrus and Juniper with contrapuntal exotic spice provided by Cardomom, Nutmeg and Hougari Frankincense - aka Boswellia Sacra, from which this unique gin derives its name. 12 botanicals in all make this elegant and finely balanced gin delicious to drink straight! Makes a subtle and luscious Martini or G&T. Ginmasters 2009 Overall Winner with a score of 98/100! Where to buy Sacred Gin ? Sacred Gin Supermarkets & Stockists. You can buy Sacred Gin online in most retailers and find it in the Gin aisle in supermarkets but we found the best deals online for Sacred Gin in DrinkSupermarket.com, TheDrinkShop, Amazon.co.uk, and others. Compare the current price of Sacred Gin in 70cl size in the table of offers below. Simply click on the button to order Sacred Gin online now.